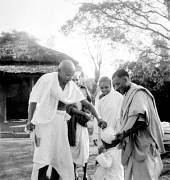 Mahatma Gandhi, a harijan child and others in Midnapur (East Bengal), January 2, 1946. Mahatma Gandhi, addressing the congregation after a prayer meeting, January 2, 1946. 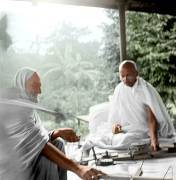 Mahatma Gandhi and KAG Khan talking about spinning at Khadi Pratishthan, Calcutta, January 3, 1946. Mahatma Gandhi in his 3rd Class Special Compartment leaving Sodepur for Assam, January 8, 1946.